Camera Path Editor is a freeware, it cannot be sold or rented. You can freely copy it and distribute it. In case of distribution (CDROM, ...), you should simply inform The oZone3D Team (info [AT] ozone3d [DOT] net). For any bug report or feedback, please send an email to support [AT] ozone3d [DOT] net and add "[CPE FEEDBACK]" to the subject. Camera Path Editor is a 3D spline editor. 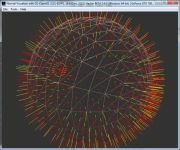 It allows to quickly create complex motion-paths based on Bezier curves. To make spline modelling easy, you can import 3D models from several formats (*.3DS, *.ASE, *.OBJ, *.XML, *.TXT, *.O3MDL). Hyperion Code fragment (*.xml): the motion-path is exported to a Hyperion script (motion-path node). Simple XML format (*.xml): the motion-path is exported to a simple XML based file that describes the position of each control point. This format is mainly intended for application developers. XML Point Array format (*.xml): the motion-path is exported to a simple XML based file that describes, for normalized time ranging from 0.0 to 1.0, the xyz position of each point of the curve. This format is mainly intended for application developers. Camera Path Editor is build over oZone3D engine and use OpenGL for hardware acceleration. Change: Update with the latest oZone3D 2.66 kernel. Feature: added filters in model loading dialog box. Bugfix: bug loading bad model file. Feature: Add welding start and end control points option in spline export. Feature: Add picking to quickly select mesh or model. 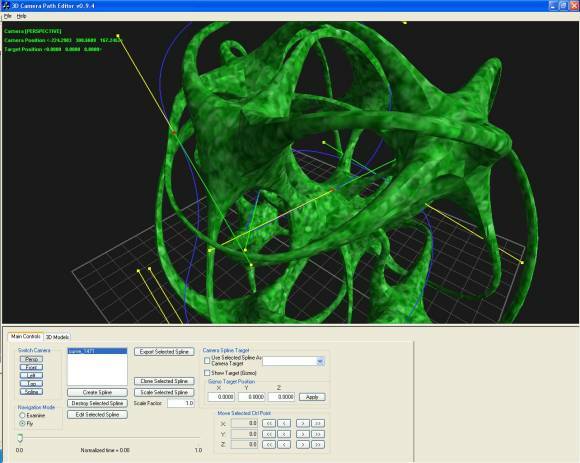 Change: Improve models manipulation (wireframe mode when selected or solid, lit and textured when unselected). Change: Improve spline manipulation (toggle depth test). Bugfix: little bug when deleting a selected model. Page generated in 0.0034818649291992 seconds.